The sad part is that Duterte isn't some pseudo billionaire "businessman", he actually ran a city. The only thing Trump has run is his mouth. In this regard, this nutcase is BETTER than Trump. We'll see if Duterte tells China to "go blank itself." 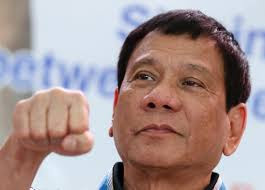 From what I understand, the Philippines has been wracked by massive governmental corruption and violence for decades. Of course, the hypersensitive ninnies who are falling in line behind Trump, or at least maintaining that there is no difference between him and Clinton, believe that the United States is equally corrupt because establishment big government something something. Sometimes I wish such people could be forced to spend six months or so in places like the Philippines or Venezuela so they could see what a real dysfunctional government is like. I have a friend with a Filipino born wife. From her I've learned that in much of the Philippines, most men are carrying a gun! The place is incredibly dangerous.